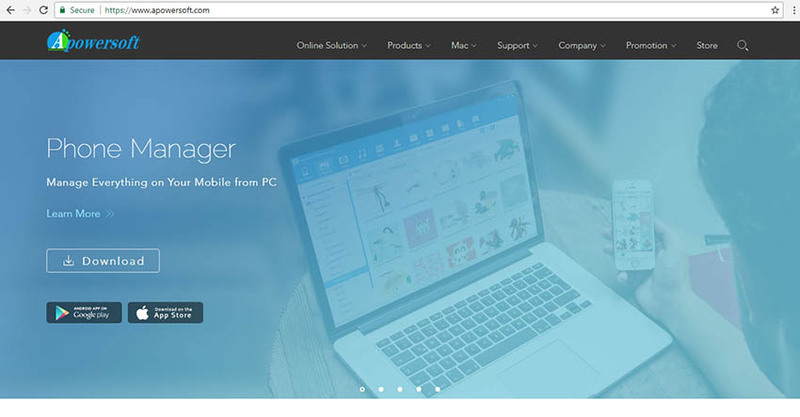 Many Vimeo users has the problem of unable to free download and convert Vimeo to MP4 for enjoying them on your portable devices like iPhone or iPad. There are many recommended online Vimeo to MP4 converter through the internet, but not all of them fit your needs. And the free tools come with this or that limitation. So here we will share tips and show you how to download a Vimeo video into an MP4 file format easily and effectively. 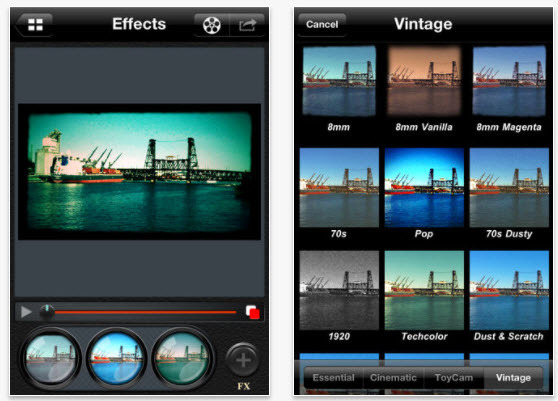 The highly recommended Vimeo to MP4 downloader and converter is iTube Studio Video Downloader. This video downloader program is easy to use and works with just a single click. iTube Studio Vimeo to MP4 Downloader not only can grab any online video from Vimeo, YouTube, Facebook and 10,000 more sites, but also can help you to convert the downloaded video to many popular formats like MP4, MOV, WMV, etc. Download videos from 10,000+ sites such as Vimeo, YouTube, Metacafe, Dailymotion, Hulu, Netflix, etc. with original quality. Convert downloaded Vimeo videos to MP4 or any other video and audio format, even presets for mobile devices. Support to download multiple videos simultaneously from a YouTube playlist, category, channel, etc. 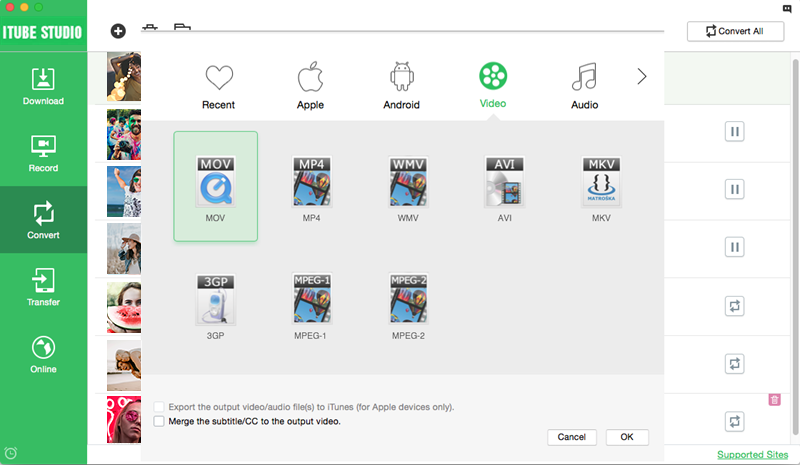 Export the downloaded Vimeo videos to iTunes library automatically, or Transfer the downloaded MP4 videos to mobile devices. Equipped with a video recorder which allows to capture any online video from any video page. Private Mode to help keep your video downloading information with a password known by yourself only. Click above "Free Download" button to get the program file. After that, follow up the installation wizard to finish installing this Vimeo to MP4 Downloader. When completing the installation, the program will launch automatically. If you are unsure how to begin a download, use the following step-by-step guide to download your desired Vimeo videos. Now go to Vimeo.com and find the video you want then play it. You will see a "Download" button appears on the top left corner of the video window. Just click the button, this smart program will load the file and start downloading immediately. Alternatively, you can copy the video URL from Vimeo, then click the "Paste URL" button on the primary window to process video download. 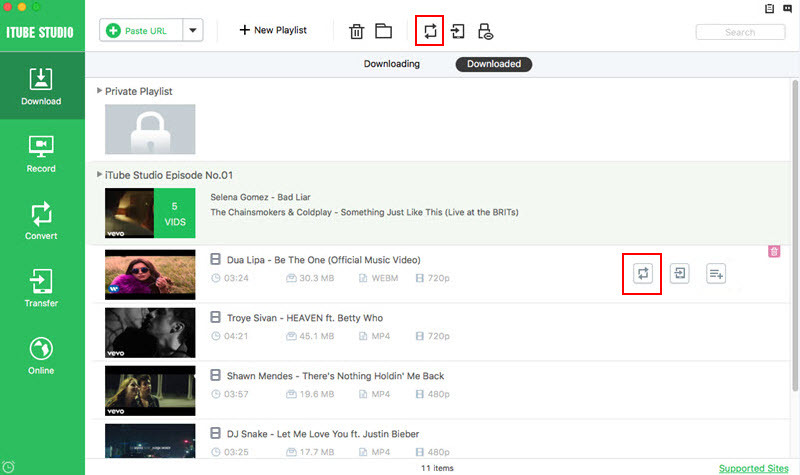 Tips: Some Vimeo video owners can make their video available for download. If so, you will see a "Download" button below the video. 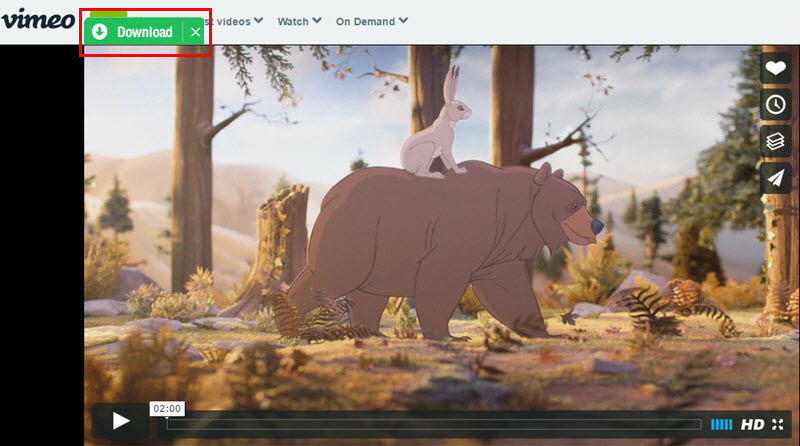 In case you get the button, you can refer to the guide on directly download Vimeo video. When you have saved all the Vimeo videos you need, you can view the video list in the "Downloaded" tab. Then click the "Add to Convert List" icon to import video to the "Convert" menu. Navigate to "Convert" menu, find the video you want to convert to MP4 in the list. Click the "Convert" icon beside the video to get a pop-up window for you to select the output format. Now click the "Video" tab and select MP4 as your target format. While this program also supports presets to fit devices like Apple TV, iPhone, Samsung Galaxy, PSP and more. So you can directly click the "Devices" tab and choose your device model as output. When you have confirmed the settings, click the "OK" button to start the conversion. The converted file will be perfectly compatible with your device. By the way, if you are seeking for an easy way to download Vimeo to MP3, here you will find the best solution. With an MP3 file, you are limited to only recording the audio of what you want to download. 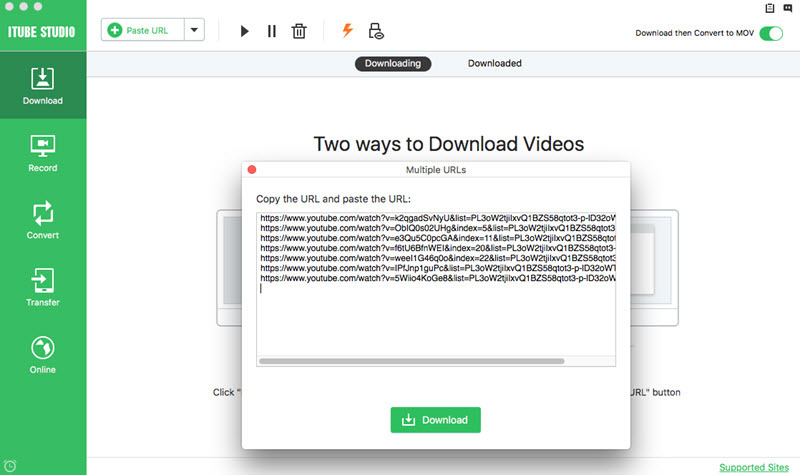 With an MP4 file, you will be able to capture both the video and audio at the same time – whether it is from a website streaming videos like Vimeo, or creating your own video to upload as a video to stream on Vimeo. Just as an MP3 file allows for an editable compression ratio, an MP4 file will do the same – allowing the user to determine both the size and quality of the video they are capturing. This also means that by sacrificing a bit of quality, you can fit hours upon hours of video in one small USB drive, or on a CD-ROM. Since an MP4 file is designed more specifically for a narrow bandwidth, they are easily compatible with Internet connections with a lower bandwidth, such as DSL and broadband. Meaning that regardless of where your Internet is coming from, you should still be able to view an MP4 file with relative ease. Keep in mind that an MP4 file will still only download or play as quickly as the bandwidth allows, and the smaller the bandwidth the more difficulty it will have. Since the user can change the compression rate of the file, they can maintain the quality of the video and audio. The file itself will then automatically adjust to maintain its quality regardless of screen size or type of device, allowing it to be played on any device that is capable of playing an MP4 file. Even as companies continue to wage war for whose devices can do more, they are almost all capable of easily playing an MP4 file.